For those who don’t know, the concept of bone conduction headphones is slowly becoming more and more popular. For your awareness, these headphones use conduction to send the sound to the ears rather than having actual magnets, or drivers in them. With that said, the concept is relatively new, but still, there are plenty of headphones available in the market. If you are looking to buy bone conduction headphones, you can easily get lost in the market. Simply because even though the headphones are relatively new, many companies have released products that are nothing more than gimmicks. In a situation like that, finding the right headphone is extremely important. The concept of bone conduction headphone is certainly an interesting one, and while I am not going to guarantee you audiophile level of music experience. If you are looking to protect your ears against harsh sounds that can cause damage. In this round up, we will be looking at 5 of the best bone conduction headphones you can buy in the market. Just keep in mind that we are going to be extensively testing out these headphones before giving our opinion, so you will not have a problem with the headphone. 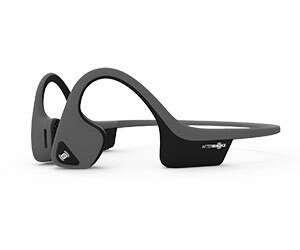 The first pair of bone conduction we are looking at is from a company called Aftershokz. Now the thing that you need to know here is that most companies will be relatively new to you. Simply because these headphones are still trying to break to the mainstream. So it is obvious that they are not as famous, or common. With that out of the way, the first pair of headphones is a wireless one. We are reviewing the AfterShokz Trekz Titanium. From the looks of it, the pair certainly looks very impressive, but is it as good as it looks? To start off, for anyone who is wearing the headphones, you are going to get an increased awareness; you will know what’s happening around your surroundings. 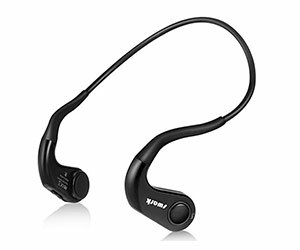 The headphones are really amazing for people who commute a lot, or go to gym frequently. Additionally, the design is lightweight, and flexible. However, there are some things that I would not side with when it comes to the AfterShokz Trekz Titanium. For starters, the neck strap is loose, the vibrations can get uncomfortable, and the battery life is average at best. Considering how these headphones are bone conduction, there is nothing you can do about the sound leakage. Overall, the AfterShokz Trekz Titanium are okay at best. They are nothing mind blowing. Sure, the technology is definitely interesting, but the thing is that it is going to require a fair amount of work before it can become mainstream. The design is lightweight, and flexible. Good for office environments, as well as gym. There is obvious sound leakage. The neck strap is loose. Aftershokz is back with another bone conduction pair of headphones that is for people who are looking for some nice pair of headphones. Now the thing is, that so far, the biggest company making these headphones happens to be Aftershokz. So, you will be seeing more of them than anyone else. With that said, today, we look at the AfterShokz Trekz Air. As the name suggests, these headphones are for people who are looking for something lightweight. The design happens to be one of the lightest you will be able to find in the market. The headphones are great for situational awareness, the fit is comfortable, as well as stable. However, there are some rising concerns that just don’t go away. For starters, the overall volume is on the lower side, and the headphones tend to produce a noticeable ear tickle that can be a problem with those who have sensitive haptic sensors in their body. Additionally, the sound quality is a big potpourri of different frequencies, and can be a bother. Last but not the least, the battery life is just average at best. 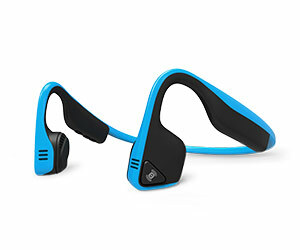 Overall, the Aftershokz Trekz Air are headphones that are made for a very niche audience. Sure, you might feel like that they are giving you everything you could possibly want, but the thing about these headphones is that they are lacking in some of the most requested sections. The headphones are comfortable and stable. They are lightweight, and flexible. You get some pretty amazing situational awareness. There is ear tickling present. Sound quality itself is average at best. The battery life is very short. So far we have tested some amazing bone conduction headphones, but don’t worry, the list is not just going to end. There is a company called Swark that is known for creating some amazing wireless bone conduction headphones. Are they good enough to be in the list? Let’s find out. To start off, the headphones are not the cheapest, but that is fine as most of the bone conduction headphones are on the expensive side. 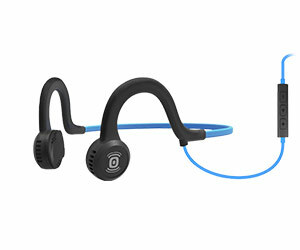 However, these headphones do come in tow colours for those who are looking to have some changings. These headphones use the Bluetooth 4.1, meaning that the transmission that you will be getting is going to be effective, as well as efficient on the battery, and the overall range is higher as well. The headphones are made out of solid material that is also comfortable around your ears and does not cause any issues whatsoever. Overall, there is not a lot to dislike about these headphones. Simply because they are doing the job they are intended to do. There is absolutely no issue whatsoever, and the best part is that the headphones are extremely simple and comfortable as well. If there is something that I can complain about, it is only the sound quality, which is something obvious, thanks to the way these headphones work. The sound quality is average at best. We are now looking at headphones from a company called Vidonn. Again, I know the company is relatively new as compared to what users are normally used to. But that is something common with most bone conduction headphones, since they are relatively new in the market. Now there are some pretty good things about the Vidonn F1. For starters, they are among the most comfortable pair of bone conduction headphones that we have tested. The best thing is that you can just wear them and forget that they are there. Additionally, the headphones are competitively priced, and I can assure you that you will not be spending a crazy amount of money on them. Last but not the least, these headphones are certainly one of the clearest sounding headphones I have tested so far. Despite the good things, the Vidonn F1 are not perfect. For starters, the overall sound, especially the bass is not as dynamic as some might prefer, and the headphones do not come with any carrying case. Overall, the Vidonn F1 are better than I had expected. Sure, there are many options available in the market, but the thing that you need to know that you are not going to get the best sound quality, or a protective case. If you are okay with these things then the Vidonn F1 is a great option that you should invest in. The sound is surprisingly clean whether you are listening to music, or talking on calls. It is priced competitively as compared to the other options in the market. The overall volume of the headphones is on the lower side. There is not enough dynamic bass present. You will not be getting a carrying case with the pair. The last product on the list is again by Aftershokz, and this time, we are looking at something that tends to take the whole concept of bone conduction headphones into the future. I am not saying that after using this pair of headphones, you would stop wanting to use the standard pair of headphones that are more popular, but these are certainly great bone conduction headphones. For starters, the headphones are very comfortable for longer periods of time, he overall sound quality is decent, and the headphones are also lightweight. The fit is great, and you won’t feel the headphones slipping off unexpectedly. Surprisingly, the battery life can last you around 12 hours of continuous use which is impressive. The headphones also come with a sweat proof design, so you are definitely getting some good value. With all the good things aside, there are a few downsides that are important for you to note. For starters, the headphones are notorious for leaking sound, which should not be a surprise, since it is a common affair. Additionally, the battery pack that comes with these headphones is on the bulkier side. Overall, the AfterShokz Sportz Titanium are pretty great for the price you are paying, and you should not have any major issues as far as the performance is concerned. The battery pack of the headphones is on the bulkier side. There is a sound leakage issue. 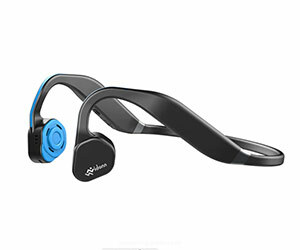 There is no denying that bone conduction headphones are relatively new in the market. However, the thing that is more important here is that they have slowly start to make waves, and for all the right reasons as well. These headphones are great for people who are looking for something that provides them the right amount of situational awareness. It is understandable that people who are looking for bone conduction headphones might have a difficult time finding the perfect pair. That is why through the help of this list, you will be able to buy the best possible pair of bone conduction headphones you can buy. If you want to know what the best pair in our opinion is, the award has to go to AfterShokz Sportz Titanium. Simply because this is the pair of headphones that provides the most value for money, and for all the good reason as well. With this pair of headphones, I can assure you that you will not have to look for any other bone conduction headphones in the market. Since there are constantly new versions, and models coming out, we will be sure to have a look out for more options and update the list accordingly.